This is an old version of the toolkit – the newer Design with Intent toolkit v.1.0 is also available and is much better! You have a product, service or environment–a system–where users’ behaviour is important to it working properly (safely, eï¬ƒciently), so ideally you’d like people to use it in a certain way. Or maybe you have a system where it would be desirable to alter the way that people use it, to improve things for users, the people around them, or society as a whole. How can you modify the design, or redesign the system, to achieve this: to inï¬‚uence, or change users’ behaviour? 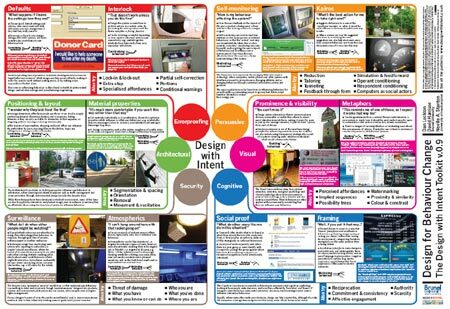 The Design with Intent Toolkit aims to help designers faced with ‘design for behaviour change’ briefs. The poster* features 12 design patterns which recur across design ï¬elds (interaction, products, architecture), and there are also 35 more detailed here on the website. Some of the names will be unfamiliar, but we hope the patterns and examples will be understandable, and inspire your own concepts. Think about how you might apply the ideas to your brief, and what could work given what you know about the problem. If you get stuck, try combining ideas from diï¬€erent patterns: many real examples can be thought of as using two or more patterns. Nedra Kline Weinreich, author of Hands-on Social Marketing, has created a clever Design Approach for Behaviour Change worksheet based on the 12 patterns from the Design with Intent poster, by re-framing each of the patterns as a question. This is a great idea, turning the patterns into cues for you to think about relative to your problem. After working through the questions, you pretty much end up with a set of possible solutions. What sort of behaviour are you trying to achieve? Thank you. This is very valuable material for a newcomer to this side of the design world. Thank you, this is really interesting work. Feel very lucky to have found your website. I have been looking to create a toolkit like the DwI Behavior Change Design Toolkit for some time. I couldn’t have come close to doing a better job. I’m a MAsters student in Environmental Studies at York University in Toronto, Canada. Thanks! I think I may have found a way to sharpen my research interests. Cheers. Pingback: Home truths and having your mates round « stuff//stuffing//stuffed. The work you present is an insightful contribution to designers like me. I have often operated on freestyle mode and now I can add concepts to my research on design structures.